If you’re looking for a more unique home exterior, you’ve come to the right place. Board and batten siding looks different than other siding styles thanks to the way it’s installed onto your home. We’ll show you why board and batten siding is a great option for homeowners in Milwaukee. Before you can learn the benefits of board and batten, you’ll need to know what it is first. Board and batten is a unique style because of the way it’s installed. It consists of alternating width, vertical panels. This helps give your home more depth than if you were to go with a more traditional siding style. Now that you know what board and batten siding is, it’s time to learn about its benefits. Below are just a few of the reasons why board and batten siding is perfect for Milwaukee homeowners. Who doesn’t love saving money on their energy bills? Board and batten siding will help you do that thanks to the foam insulation board that’s installed beneath the panels. This helps trap heated and cooled air in your home and keep the outside temperatures out. When you choose a home exterior, you want there to be many options so you can customize it to fit your needs. That’s just what you’ll get with our board and batten siding. We offer many different colors to choose from, including wood-look siding. Plus, you’ll never have to worry about fading or discoloration because the color is baked into the panel when it’s manufactured. 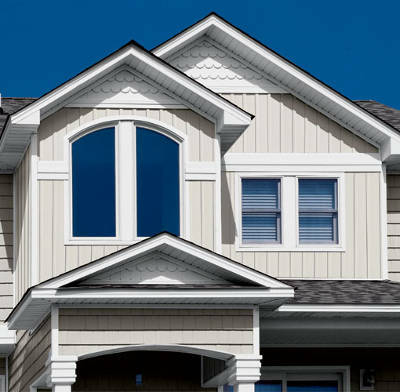 One thing that board and batten siding offers that you won’t get with any other siding style is its unique look. Board and batten is sure to improve your homes curb appeal thanks to its alternating width panels. By the boards being different lengths, it gives your home more depth and dimension than any other siding style. That’s why this is the most eye catching siding style available. If you’re looking for board and batten siding in Milwaukee, then Feldco is here to help. We’re Milwaukee’s #1 siding company. Our board and batten siding is custom-made to fit to meet your exact specifications. Not only that, but our siding is installed by factory trained and certified professionals. You know you’re in good hands when you choose Feldco for your replacement siding project. There’s a reason we’ve been able to help over 350,000 homeowners. Get a free quote now for replacement board and batten siding for your home.